Electrical and Electronics Engineering is a continuously evolving subject. As technology has advanced, so have the challenges facing the modern engineer. A silicon chip containing over 100 million transistors in an area no larger than a postage stamp is yesterday's news. EEE is a subject that naturally partners with other disciplines to open whole new engineering avenues. Examples include Mechatronics - with Mechanical Engineering, Bio-medical Sciences-with Medicine and Avionics-with Aeronautics. 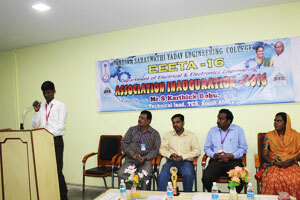 The EEE Department at Pandian Saraswarhi Yadav Engineering College prepares students in this field using new-age information and computer-intensive technologies. The faculty in the department is a rich blend of personnel with industrial and professional experience. The dedicated staff members have sound knowledge in emerging areas like embedded systems, power electronics applications in power systems, embeded systems,VLSI etc. The breadth and depth of the research interests of the academic staff ensures a high standard of lecture courses and provides excellent opportunities for challenging and stimulating final year projects. Individual lecturers supplement their delivery using blackboards, overhead projectors and video projection. The B.E degree program is designed to achieve a balance between depth of knowledge acquired through specialization and breadth of knowledge gained through exploration. The undergraduate degree courses offered by the department provide a comprehensive foundation in the core topics of EEE coupled with an area of specialization relevant to emerging engineering challenges. The curriculum has been designed to create professional electrical and electronic engineers, who can serve in the fields of core electrical engineering, information and communication systems, and other related fields. In EEE, there is growing awareness that the future training and education of electrical engineers in the industry needs to be in the area of highly efficient, industry-relevant skills formation, to enable frequent and rapid deployment of professional skills in new areas. As a step in this direction, the postgraduate programs in power electronics & drives and in power systems were evolved. 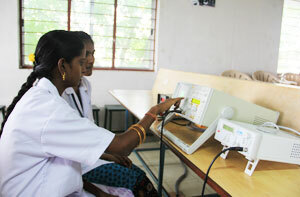 The research division covers various aspects of electrical engineering. There is an active and growing area of research in the field of power electronics & drives, power system , Control System and Instrumentation. The research group focuses on power electronic devices and integrated circuits, and their uses in various applications. Other major research strands include SMART GRID and their integration in power systems,Controllers,Bio medical image processing.